In March, the business administration major and sergeant in the U.S. Army Reserve was named “Noncommissioned Officer of the Year” at a brigade-level competition held at Fort Knox, Kentucky. The multi-day event, part of the Army’s annual Best Warrior Competition, involved numerous physical and mental challenges. Among other things, Schumacher completed a written test, battle drills, day and nighttime navigation exercises, an obstacle course, and a 12-mile road march made while carrying 40 pounds of weight. With that win behind him, Schumacher advances to the division-level competition, April 9 to 14 at Joint Base McGuire-Dix-Lakehurst in New Jersey. There, he’ll compete against other Army Reserve soldiers for two titles: “NCO of the Year” for the 104th Division (Leader Training) and “NCO of the Year” for the 108th Training Command. “A competition for any subject matter is a great way to test your respective skill set,” Schumacher said. “Winning proves a person has adequately prepared, while losing displays what … needs improvement. Schumacher, a Lynchburg, Virginia, native, transferred to the University of Lynchburg in 2018 after earning an associate degree in business administration. 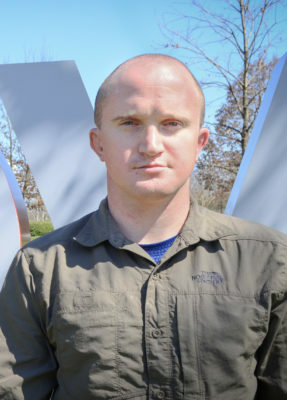 His military job is satellite communications system operator and maintainer, but he also trains cadets at Fort Knox. Before coming to Lynchburg, he also served the Army on active-duty status for four years.